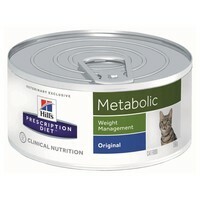 Hills Prescription Diet Metabolic Weight Management Wet Food for Adult Cats is a nutritionally balanced diet to help your cat lose weight naturally without feeling starved. Made with a carefully developed nutrient complex that adapts to suit your cat’s individual energy requirements, Hills Metabolic has been designed to work with their natural metabolism and encourage body fat loss. The food is obviously very palatable as it is scoffed the second the bowl is put down with the bowl licked clean! 5 Stars!